(0 Customer Reviews) | Write Review 6 issues per year Mercedes Driver magazine is a premium monthly publication, devoted to real owners and enthusiasts of this prestigious German car brand. Mercedes Driver magazine will reach out to owners of classic models from the Pagoda to the SL and everything else in between. Covering the most coveted models with detailed and informative features, written by people who are knowledgeable and passionate about the marque. There will be a comprehensive blend of owners’ features, practical advice, drive stories and definitive guidance to buying, owning, maintaining and modifying popular Mercedes models. Mercedes Driver is brought to you by Kelsey Media who publish over 30 automotive magazines. Each delivering exceptional content that inspires, entertains and engages people wherever and whenever they choose to consume it. 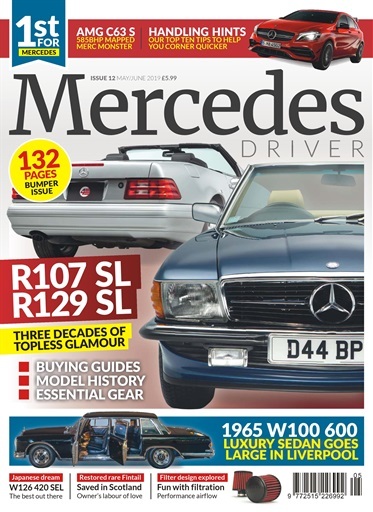 Therefore, for the most in-depth and authoritative round up of all the major Mercedes cars, Mercedes Driver magazine will be the No1 choice for fans of this iconic brand. Mercedes Driver magazine is a premium monthly publication, devoted to real owners and enthusiasts of this prestigious German car brand. You'll receive 6 issues during a 1 year Mercedes Driver Magazine magazine subscription. You'll receive 6 issues during a 1 year Mercedes Driver Magazine magazine print subscription.